After notification of your award, you will be receive a Cultural Services Contract that details one or more grants awarded to your organization. The Cultural Services Contract is a binding legal agreement that requires the grantee to carry out certain activities or provide services, paid for, in part, with funding received from the NYSCA. Noncompliance with the terms of the Cultural Services Contract may require the return of funds to the state, and may affect eligibility for future requests for NYSCA support. The initial grant payment is made on all contracts following full execution of the contract. Contracts that are below $10,000 will have the terms and conditions that are attached to the grant award. These terms are deemed executed once the grantee has signed and returned by email the one page grant confirmation document attached to the award Contracts that are at or above $10,000 in total will have the terms and conditions set out in the Grants Gateway system. Grantees must proactively enter the Grants Gateway system to complete, review and electronically sign grant contracts. A Step-by-Step Contract Guide to completing your contract in Grants Gateway follows. Please make sure to promptly work to execute your contract prior to the contract start date and be on the alert for notifications and communications from NYSCA regarding your contract. To find a full version of your Grants Gateway contract, log in as a Delegated Admin or Contract Signatory on Grants Gateway and find the Contract Main Menu of the specific project. 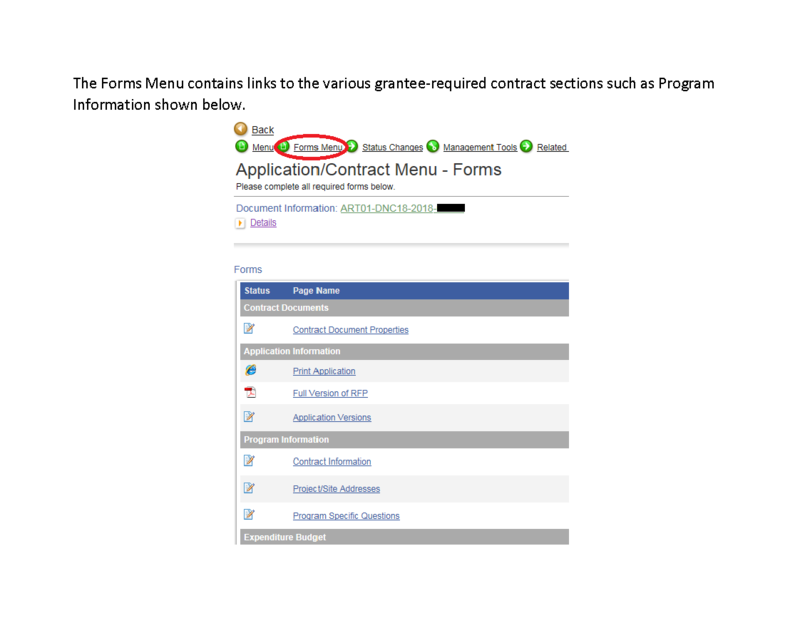 You will then be able to download a full PDF of your contract from the Forms Menu under “Contract Preview” (includes signatures, terms, funding breakdown, and full workplan.) You should download a full version of your executed contract for financial and administrative record-keeping. 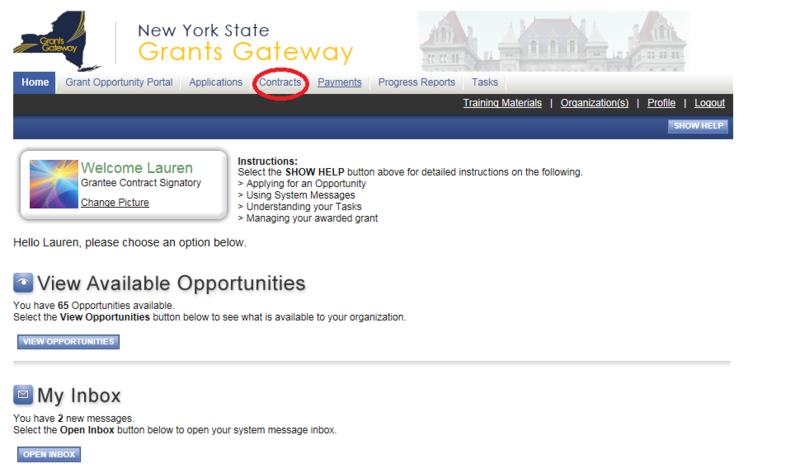 To log in to the Grants Gateway, visit grantsgateway.ny.gov and click Login. Only individuals with Grantee Contract Signatory or Grantee System Administer accounts have access to edit, complete and submit the contract. For more information, visit page 16 of the Grants Gateway Vendor Manual. To access the contract Main Page, click on the Contracts tab at the top of the Home Page. 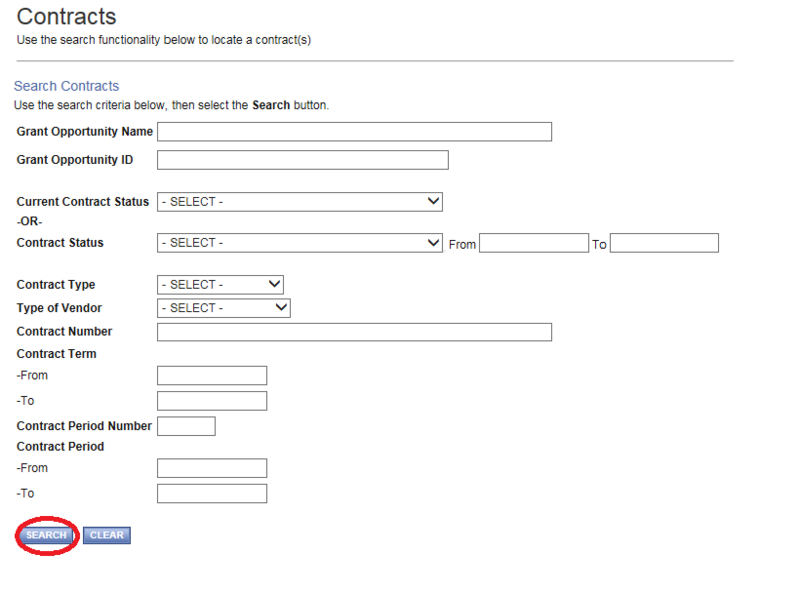 On the Contracts page, leave all search fields and dropdowns blank and click SEARCH. A summary of your contract information will appear at the bottom of the page. Click on Application Number to access the Contract Main Page, which provides information such as the contract number, term and period. If you have more than one contract, click the application number corresponding to the contract you wish to work on. Please consult your award letter to be sure you select the correct contract. 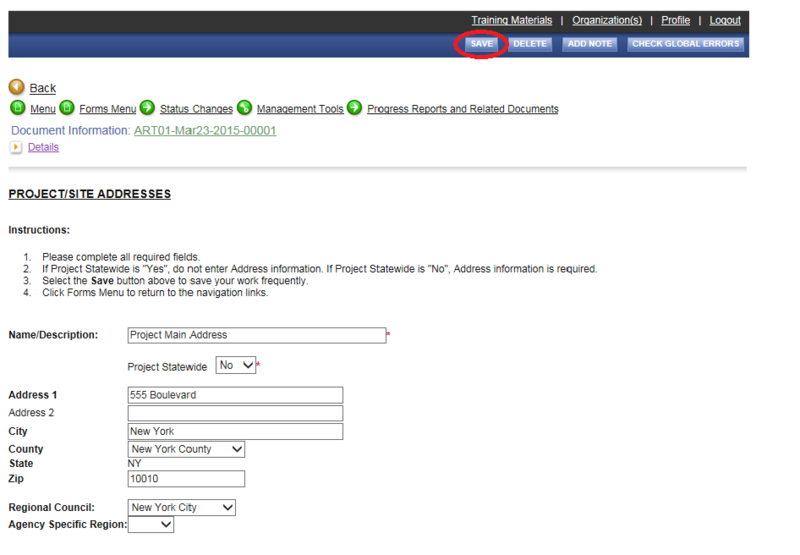 The contract status should say "Grantee Contract Info Requested." 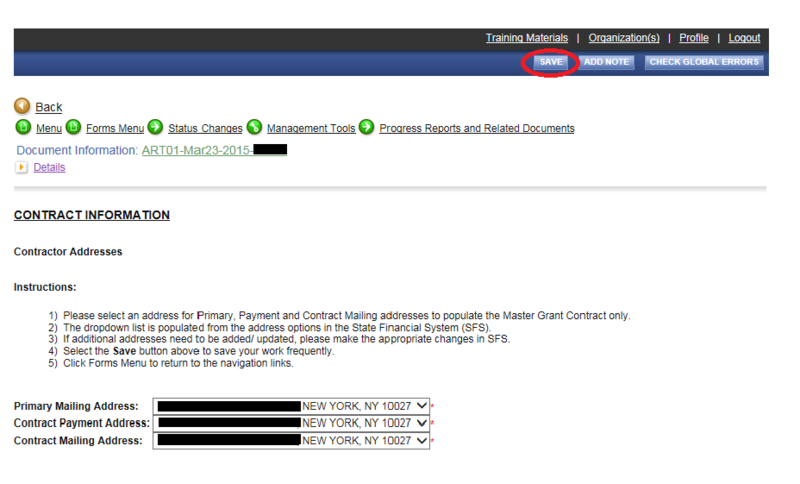 To access the Forms Menu Page, click on Forms Menu located at the top of the Contract Main Page. The required grantee-defined sections include Program Information, Expenditure Budget, and Work Plan. All grantee-defined sections can be accessed from the Forms Menu Page. You will use this menu for steps 4-6. 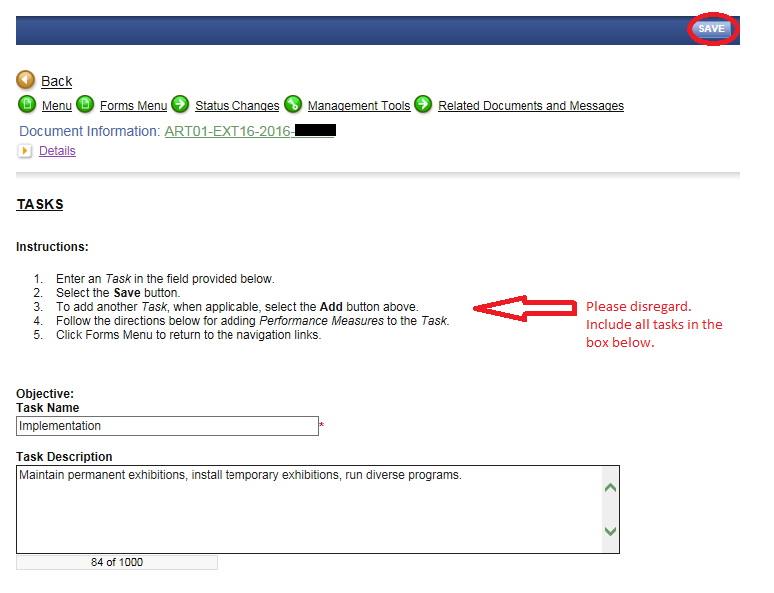 Verify that all information listed on the following pages is correct, and save your work before returning to the Forms Menu Page. *Note: All addresses listed on the Contract Information Page are populated from address options in the State Financial System (SFS). To add or update address information, please make the appropriate changes in SFS. In the Expenditure Budget section, please demonstrate how you plan to allocate one year of your NYSCA grant award to support the activities for which you applied. Be sure to complete only the budget forms applicable to your specific grant award and to save your work before moving on to the next form. Narrative sub-forms do not need to be completed for any budget expenses, except the "Contractual" sub-form. 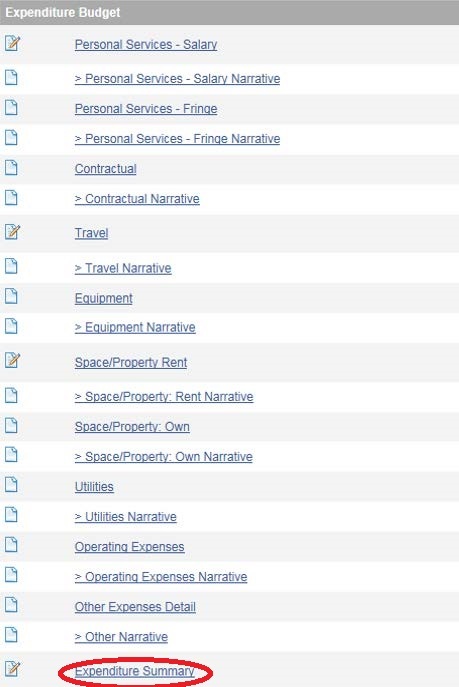 If any NYSCA funds are allocated to "Contractual" expenses (expenses used to pay non-salaried personnel), a description of the positions and salaries funded must be provided on the Contractual Narrative form. Please leave other narrative sub-forms blank. If you are allocating any funds to Personal Salary, it is critical that you review the Expenditure Budget salary tutorial. *Note: Please be aware that the Expenditure Budget will likely contain information from your application. Please review and edit your Expenditure Budget accordingly. View the Expenditure Summary to ensure everything has been entered as required. *Note: Do not complete all budget forms listed in the Expenditure Budget. Only complete the budget forms applicable to your grant award. For information on eligible expenses, please review the NYSCA program guidelines. The Work Plan, located on the Forms Menu consists of four forms: Work Plan Overview Form, Objectives, Tasks and Performance Measure. 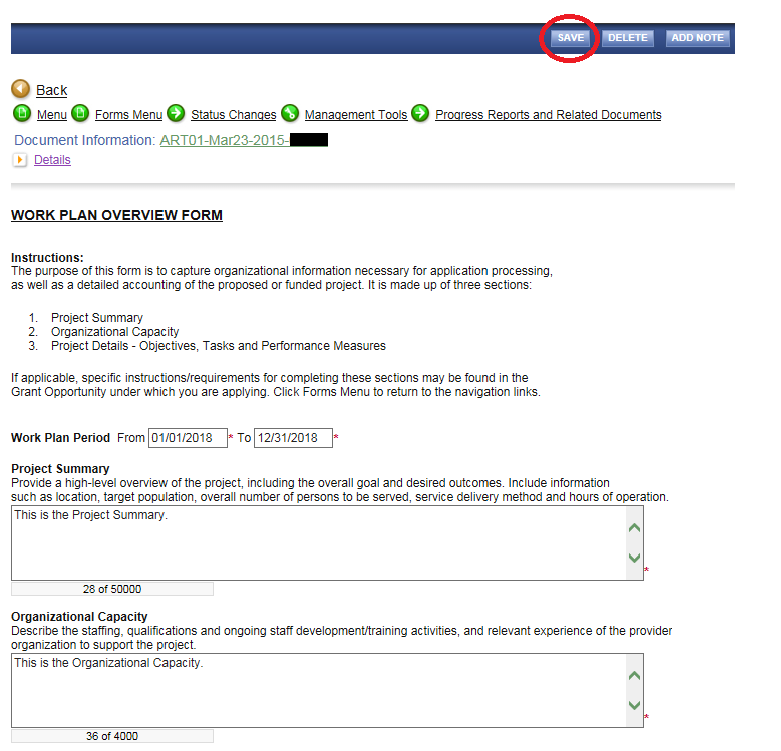 Only the Work Plan Overview form will be pre-populated with information from your application. Please verify that the information on the Work Plan Overview Form is up to date, and then complete the Objectives, Tasks and Performance Measure pages. 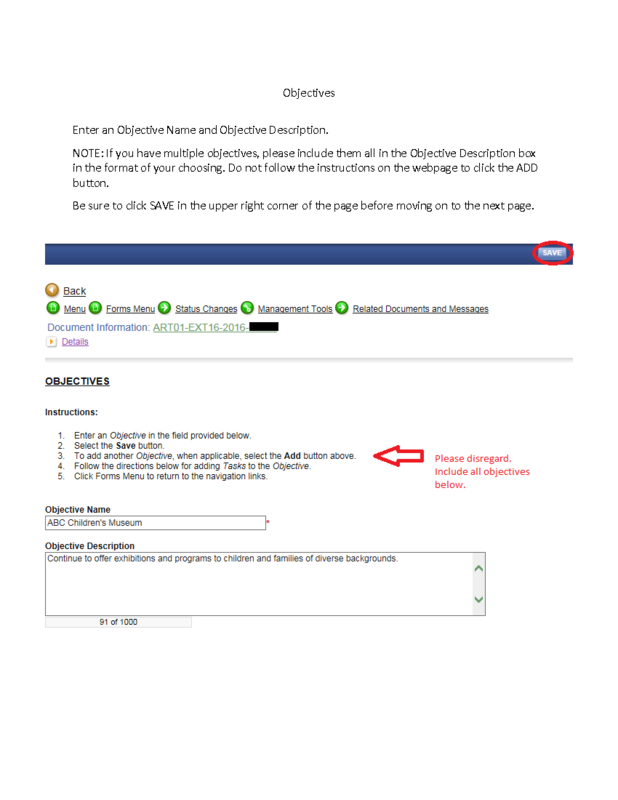 If you have multiple objectives, tasks and performance measures, please include them all in the one description box on the page. Do not click the ADD button. Be sure to save your information on every page before moving on to the next page. *Note: Objectives, Tasks and Performance Measure must be completed in order. Once you’ve completed Objectives, you can access Tasks by hovering your mouse over Forms Menu, and a navigation box will appear with a link to the next form. *If your grant total is less than $50,000, skip this step and proceed to Step 8. **If you have a multi-year grant, the total equals the sum of all funding years. Upload proof of workers’ compensation and disability insurance coverage individually to the Grantee Document Folder, which is located on the bottom of the Forms Menu. After submitting your first form, click save. Click add to upload your next form. Insurance documents must evidence coverage of the entire one-year contract period. On documents where a certificate holder can be indicated, New York State Council on the Arts and the agency’s full address (300 Park Avenue South 10th Floor New York, NY 10010) must be listed. 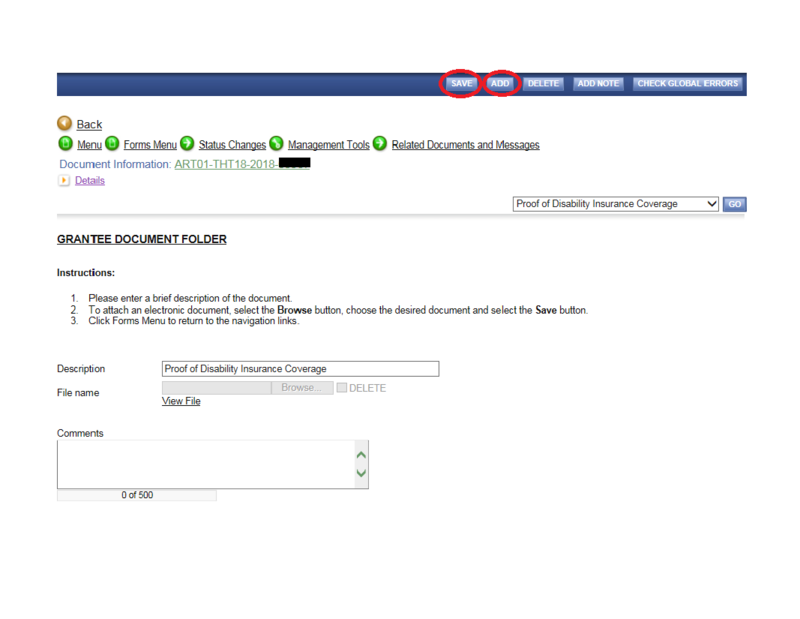 *Note: If your insurance documents are not currently accessible, you may still submit your contract for review and upload them to the Grantee Document Folder at any time. Your contract will be held in Contract Manager Review until you have uploaded the required documents. The contract will not be executed until your insurance documents have been uploaded. To submit the contract for review, click or hover over Status Changes, and then click APPLY STATUS beneath the status CONTRACT INFO SUBMITTED. 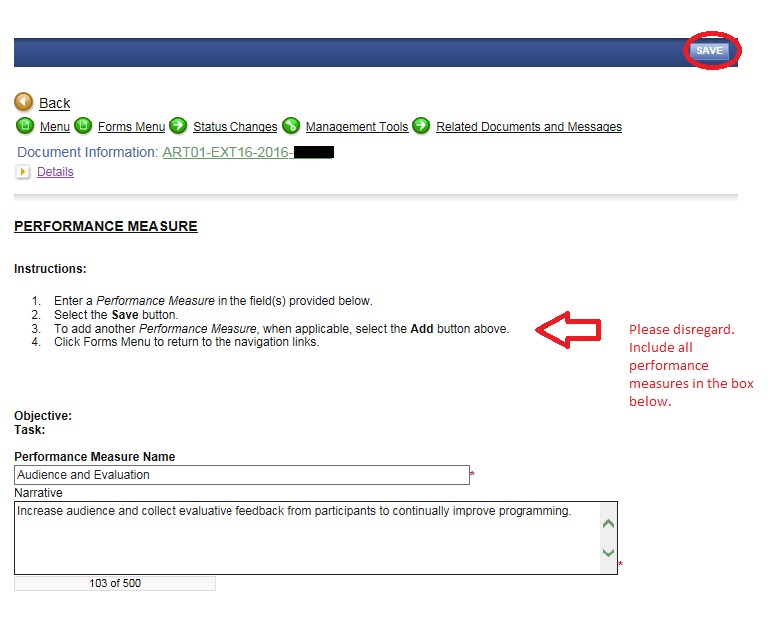 Once you have submitted the contract for review, the contract status will change to Program Manager Review. 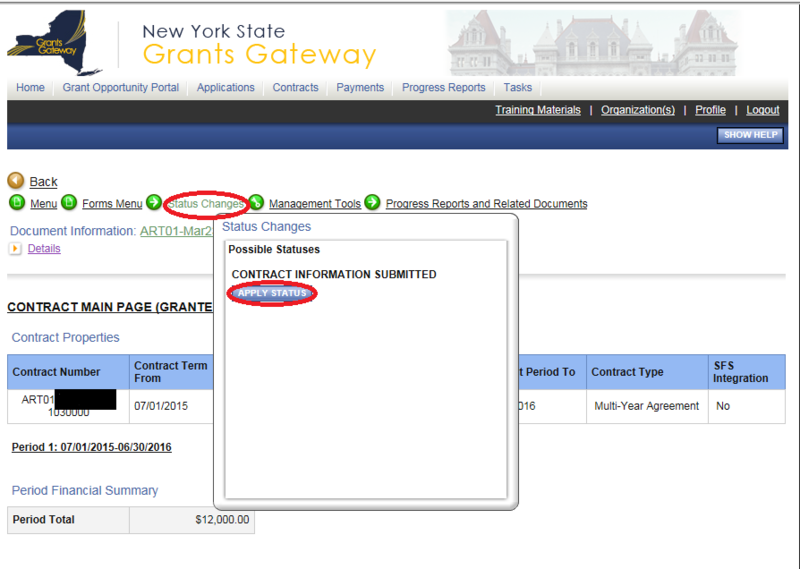 Once the contract has been approved by NYSCA staff, the contract status will read “Grantee Contract Signature Required" and you will have access to e-sign your contract. Only Grantee Contract Signatory and Grantee System Administrator accounts have access to e-sign the contract. Please note that NYSCA staff may have made changes to the Work Plan or Expenditure Budget. It is the grantee’s responsibility to review the entire contract before signing. Read step-by-step instructions on how to view and sign the most recent version of your contract here. Please keep a copy for your records.